We are proud to be different in the way we help individuals to move ahead in their career development. We help inspire and build confidence in people to take personal ownership of their career paths. We also recognise that Stakeholder relationships are key to success and we help provide enhanced skills and knowledge that our clients can apply effectively. We offer a number of high quality and unique services to both individuals and organisations. 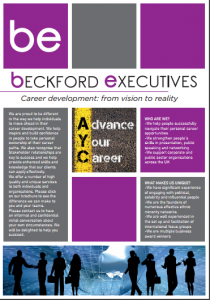 Please click on our brochure to see the difference we can make to you and your teams. Please contact us to have an informal and confidential initial conversation about your own circumstances. We will be delighted to help you succeed. Unconscious Bias – when you look at me what do you see?